Way back about 10 years ago we built a house. 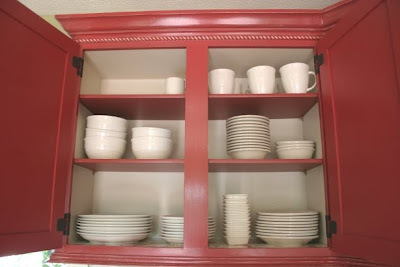 It had lovely red cabinets. They looked just about like these below. I love my kitchen now. Really, I have learned that we can be happy in any house. I don't think we will ever build again. It was fun but way overrated. Way too much time involved in getting it done when you can just find one and move in. Not sure why I am thinking about kitchen's today. They are just happy places. The smell of food and sound of fellowship and laughter. The hub of most homes. I will say of the Lord, "He is my refuge and my fortress, my God in whom I trust. Wild storms in our part of Texas last night. Whew...thankful for the rain though. It seems we are going to get this kind of weather again today. Rain, rain...don't go away. Any more twisters...you can go away. Well...he is not "the" Easter Bunny. He is just our bunny. 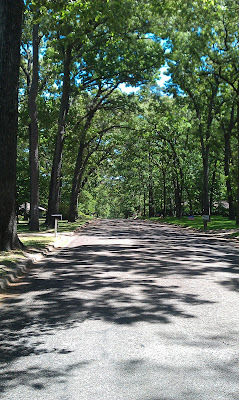 This lovely tree lined street is one that I am blessed to be able to walk up and down most days. and I can feel the breeze a little on this street. It is a quiet, beautiful morning. Our days have been pretty crazy and it makes these quiet early mornings even more special. I am pondering this statement this morning that I heard in Bible class last night. Spiritual growth specializes in violating comfort zones. When we get comfortable spiritually, are we in danger? I think that satan loves for us to be comfortable. I pray that today we will be uncomfortable. I pray that we will seek Him with a thirsty heart. Worship was wonderful this morning. Singing praises, having my heart moved and touched and having the blessing of singing Hosanna to the Highest. Praise. Palm Sunday. Today in the cycle of Passover would be Palm Sunday. Matt. 21:9- The crowds that went ahead of Him and that followed were SHOUTING, "Hosanna to the Son of David! Blessed is the one who comes in the name of the Lord! Hosanna is the highest heaven!" What difference does it make in my life? Does Jesus make a difference? John 1:29- Behold , the Lamb of God, who takes away the sins of the world. All the difference. That is what it makes. All the difference. God has made the world, the whole world, acceptable to Himself, by the blood of His Son. I am saved. I am loved. It makes all the difference. We have been doing some bird watching the past few days. This mama bird has been flying in to feed her babies for a week or so. And feeding them and feeding them. She makes me tired. I am sure she is tired. All she is doing is feeding them. Now the babies are trying to get out and get their wings to working. They are so cute and the mama is so sweet and protective. Reminds me of me and lots of other mama's. Especially the feeding the kiddo's constantly part. Mr. red bird is watching the busy-ness too. He is a little bit above it all and seems (if I do say so myself) a bit uppity. Our baby bird is about to stretch his wings and learn to fly. He would not like that description of course. I also think he might starve to death without his mama getting him food all of the time. This mama is going to sit back at a distance and watch him fend (feed) himself. Should be fun and interesting. I will miss our baby bird. We are counting on his brother to whip him into shape. It is melt in your mouth good! Ok, I know that yesterday I wrote about not eating any more sugar and I'm not. This is for YOU. I just had to give you Mom's recipe. It is so easy and so incredibly yummy. Hope that you enjoy it. It smells heavenly while cooking too. Mix well. Pour in oblong Pyrex cake pan. Heat at least 1 quart of sweetened fruit (apricots) to boiling. Pour on top of the batter. Add dollop (don't you love the word dollop?) of butter and sprinkle sugar and cinnamon on top. Bake at 350 degrees for 40 to 45 minutes until brown. Join me for a cup of joe. Pull up a chair and lets' have a visit. Let's skip the pastry or donut though. How many of those have we had in our lifetime anyway? enough is enough. Goodbye sugar. but he who speaks rashly will come to ruin. Boy have a had to learn how right this verse is way too many times in my life. With my husband and children and well...everyone. True words to live by. We were visiting our oldest last weekend and stayed with Sid's Dad. It is still so strange and well...I don't know the words. Mama Jo is not there. She should still be there up early reading her Bible and fixing breakfast and smiling and encouraging. She would have loved having two of her grandkids living in the same town as her. As you know, South Africa's Charl Schwartzel won yesterday's Masters. He began Sunday's final round four strokes off the lead, but birdied the last four holes to win the world's most famous golf tournament by two strokes. After his historic victory, he was asked how he did it. His immediate response: "Playing with K. J. Choi kept me calm." 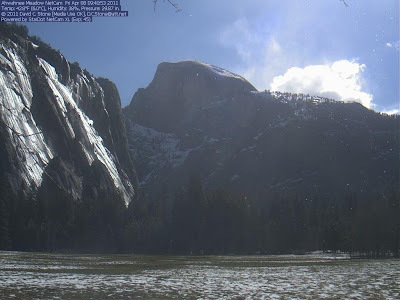 This link takes you to an unbelievable web cam that shows views in Yosemite National Park. If you need to be inspired by God's nature and beauty, just click. We were blessed to attend the Yosemite Family Encampment for about 5 or 6 summers when I was younger. It was a great time. No place more beautiful in my opinion (if you love mountains) than Yosemite. The entrance to the valley. You come through a tunnel and all of a sudden...BAM...you have this view. Awesome. Thank you God! We always stayed in Housekeeping Units like this one below. Easy for bears to enter into. I experienced this up close and personal one dark night. Yikes. Blessings! Have a great day and if you ever get a chance, choose a National Park visit for your vacation. Yosemite should be on the top of the list. Lovely. We had a straight-line pretty ferocious storm blow through a few mornings ago. Afterward I went out to check on Jack. As you can see below, he was doing just fine. After all he does have a deep hole to run into. Cutie pie.